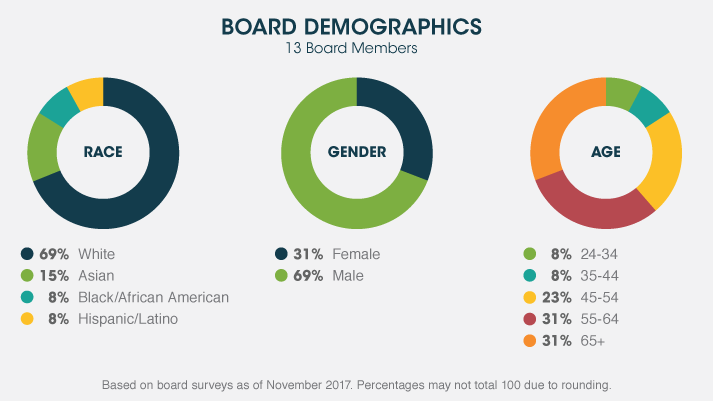 As part of our commitment to openness and transparency, the Hewlett Foundation shares data about the demographics of our staff and board. The data above are drawn from surveys of staff. Categories with respect to gender and race reflect how individuals self-identify. 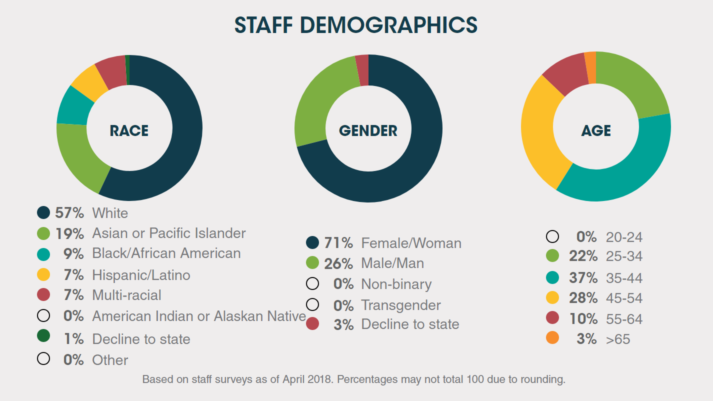 As of April 2018, the foundation’s staff is 57% white, 42% non-white; 1% declined to answer the question. In 2012, that balance was 69% white, 31% non-white, which was roughly unchanged from four years earlier, when it was 70% white, 30% non-white. The above data reflect our board of directors, which comprises 13 members including the president, as of November 2017. In 2011, the foundation adopted new policies related to board membership. Four board members must be linear descendants of William and Flora Hewlett; there must be at least five but no more than 11 additional, independent board members. All but one of these board members serve three-year terms, with a limit of four terms. One of the family slots is for a “special director,” typically from the next generation of Hewletts, who serves a single two-year term.